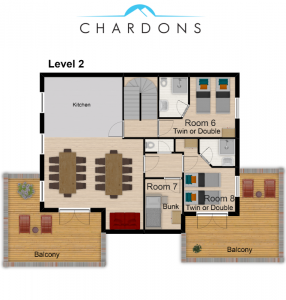 Chardons Amelie is a spacious, modern and beautifully designed ski and snowboard chalet in Val d’Isère offering excellent value holidays in Val d’Isère at cheap Chardons prices. 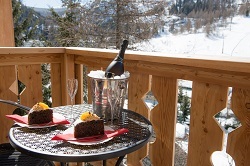 The chalet is in Le Fornet right next to both the village centre and the ski lifts and slopes. The Le Fornet cable car is situated directly in front of the chalet. 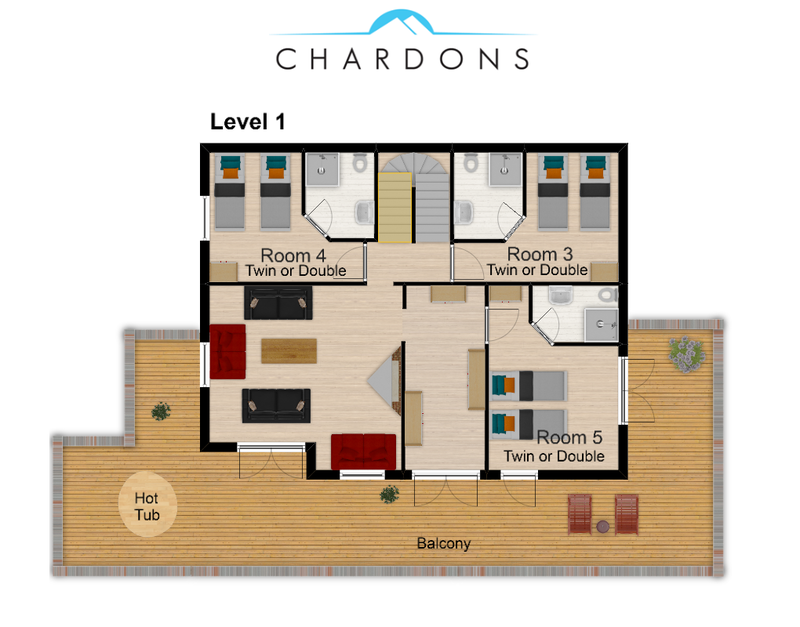 The chalet has a hot tub on the balcony with beautiful mountain views. All rooms are fully en-suite with attractive stone and wood used throughout. Revel in the Val d’Isère nightlife, just a short and free 10 minute shuttle-bus ride away, or enjoy the local atmosphere in Le Fornet’s own bars and restaurants. 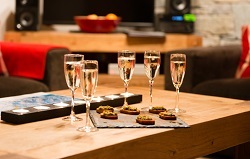 As with all our accommodation this Val d’Isère chalet is great value and offers skiing and snowboarding enthusiasts a top-quality chalet holiday at unbeatable prices. 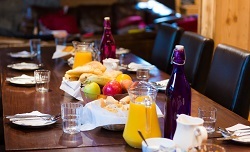 All in all the chalet represents excellent value for money for those wishing to try the Val d’Isère experience. Came out as a big group of us yet each individual need was treated as if we were individuals. Very affordable for the service and the staff just gave 110% and good fun! Can’t wait for next year with Chardon!! 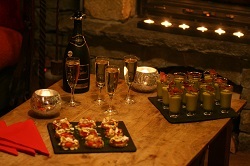 We had an amazing holiday in Val d'Isere and one of the main reasons was Chalet Amelie! We were a group of 5 families and stayed there the first week of Feb. 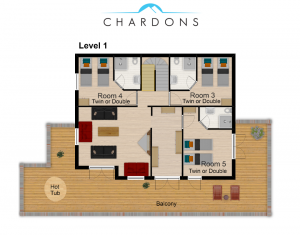 The chalet itself is not luxurious but very comfortable ,and has really everything you might need ,including a hot tub with the most glorious view. Location is perfect-just across from the Le Fornet ski lift and bus stop in case you want to travel into town( 10 mins away) or another ski lift. Stayed by the chalet with my friends and had the most amazing time of our life’s!! The girls are just truly amazing and always have a smile on their face. The 5 star food is served by the worlds greatest chef!! If in Val d’Isere don’t make a mistake and stay some where else. Trust me the chalet is the answer!! We are reluctant to share this little gem in Fornet. It is An excellent ski location, easy to get to the clubs in the town but best of all is the whole Chalet Amelie Team they kept the place tidy and clean, over fed us with amazing food - so much better than your usual catered Chalet - and were all excellent hosts. Breakfast, tea and supper were wonderful accompanied by decent wine. Thanks Bret, Eve, Frankie, Verity and Mikkaila for making our New Year such fun and so relaxing. This was the 4th time we've stayed in Chalet Amelie. The location, directly opposite the Le Fornet lift is perfect. We arrived very late (1.00am Monday morning) but the team had left us a cooked dinner and they were there to welcome us even though it was so late. The food is always excellent but this year it was exceptional, Brett, the chef, is superb and his food is worth a stay in the Chalet alone. The team this year of Eve, Charlie & Verity really took care of us, nothing was too much trouble. 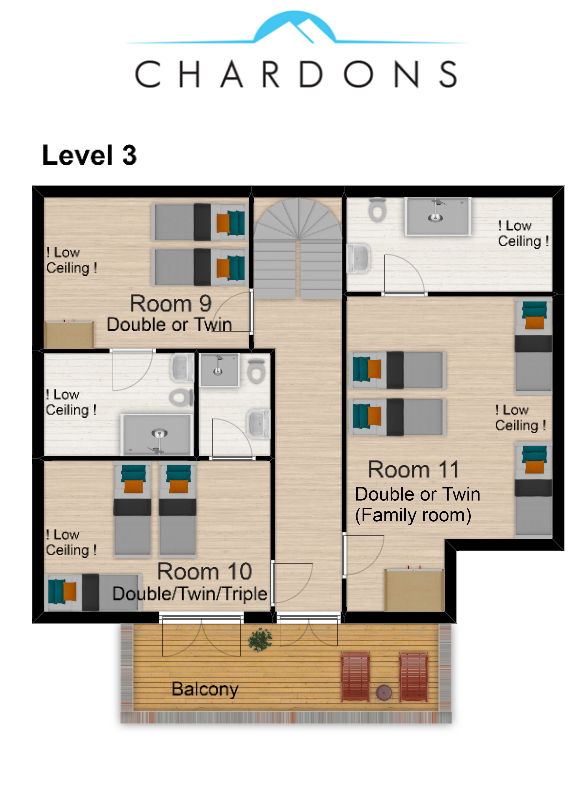 7 4 family or friends shared room for 4 people with room 8. A double room and separate adjoining bunk with en-suite shared shower/bathroom with WC and balcony. 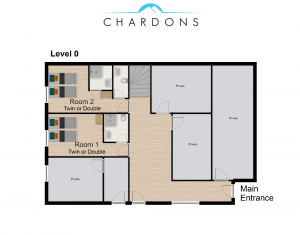 These rooms must be taken as one unit for 4 people as the shared shower-room is accessed via the double bedroom. 8 4 family or friends shared room for 4 people with room 7. A double room and separate adjoining bunk with en-suite shared shower/bathroom with WC and balcony. 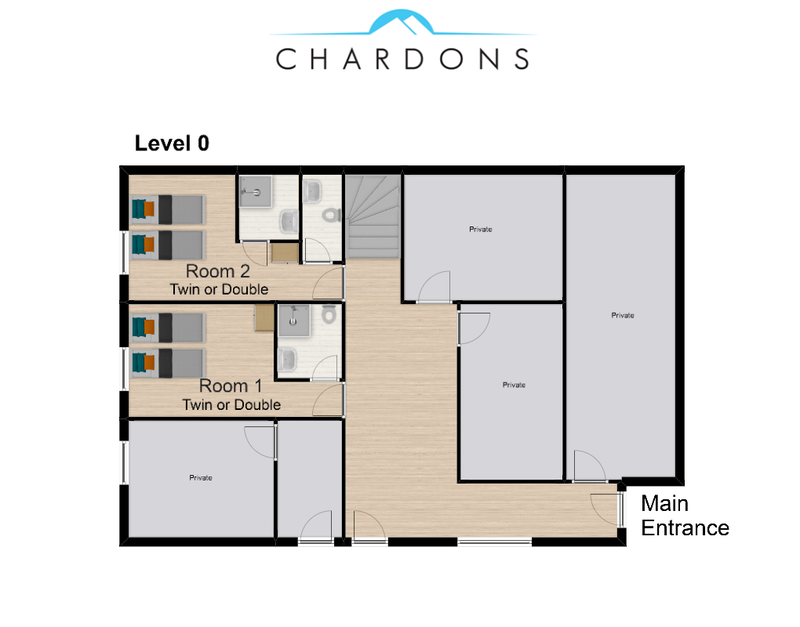 These rooms must be taken as one unit for 4 people as the shared shower-room is accessed via the double bedroom. 11 4 quad family room. 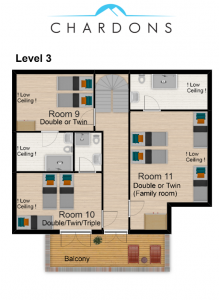 Very large master bedroom with double bed and two extra single beds under the eaves. 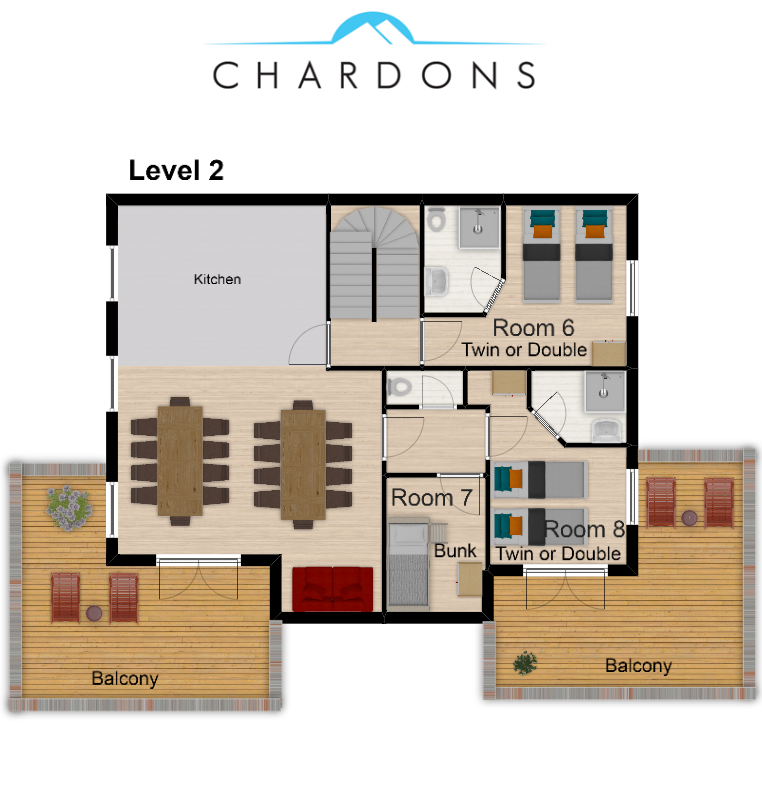 Balcony, large en-suite shower/bathroom with WC. Perfect for families. 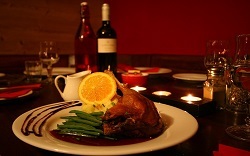 The food served at Chalet Amelie is one of the highlights of your holiday. We believe that skiing and snowboarding should be about getting fresh air, exercise, thrills and spills… and then coming back and completely spoiling yourself! 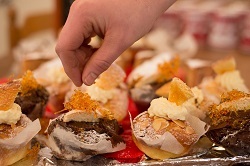 Chalet Amelie offer restaurant quality breakfast, afternoon tea and a five-course evening meal including canapés and a cheese board each evening served with complimentary French bottled white and red wine. Chef’s night off is normally on a Wednesday when the hotel staff have some well deserved time off. 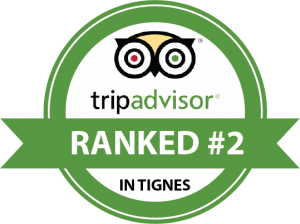 Our staff will be happy to recommend some of the many excellent restaurants in the village. A selection of French Cheeses served with homemade onion chutney, mixed fruits, crackers and complimentary Port or Genepy and freshly brewed coffee.